Nice T-shirt. Terrible way to spend your inbound marketing budget. There’s a simple point to be made here. When you’re sending multiple streams of inbound traffic to your homepage (or registration page, cart page) the original upstream ad message gets lost in a flood of generic multi-channel multi-product communication that dilutes the experience to the point where the visitor just does the browser shrug and leaves. For the record, the browser shrug is the physical embodiment of real-life disappointment, akin to a simultaneous clicking of the back button whilst saying “meh” out loud. A great example of the crowded marketplace that is a homepage vs. a focused landing page can be seen in this comparison post about Campaign Monitor. Where the landing page has 1 interaction point vs. 412 on the homepage. Inbound marketing sources typically include email, PPC, banners (display ads) and social media. Each of these sources should be treated with the respect the ads deserve – which means a nicely tailored landing page for each. Stop wasting money and time sending traffic to your homepage. There’s an exception to most rules (don’t eat yellow snow is fairly safe however). 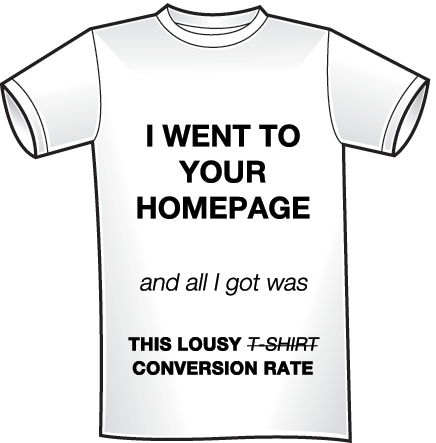 If you’re selling a single product or service that’s very focused, then sending traffic to your homepage is totally OK – just make sure you do actually spend some time testing your home page to make it convert better. Remember to edit ruthlessly and refine your messaging to really explain with clarity what it is you do/offer. You should still use a landing page when you are running promotions (particularly private ones for affiliates and such) so that you can keep your homepage clear of all the clutter.